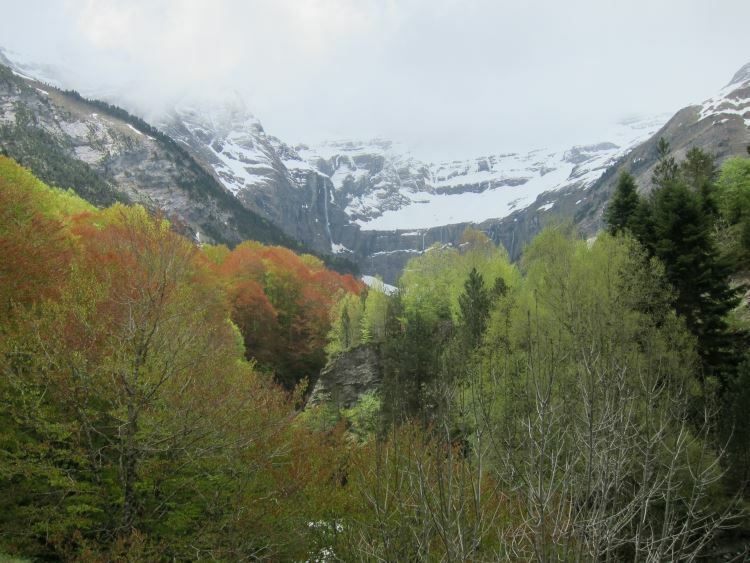 The Cirque de Gavarnie is perhaps the most famous single site in the Pyrenees: a glacial scoop out of the heart of the high range has created a spectacular semi-circle of cliffs, some 1,400m from the bottom to the high ridge top. There are excellent walks in the Gavarnie valley itself, but the most rewarding are a bit further afield: while the cirque itself and the better known local trails are crowded trails in the high summer months, you can get away to less-frequented trails to (almost) equally spectacular cirques and other features. 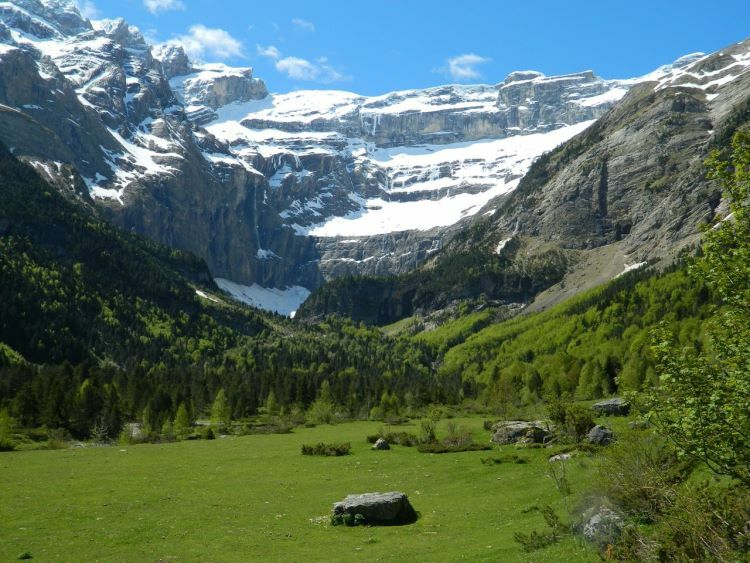 The finest (but famous) walk in the area is the tough ascent to the Breche de Roland, a huge notch in the high ridge, from which you can cross to Spain and the Ordesa area. 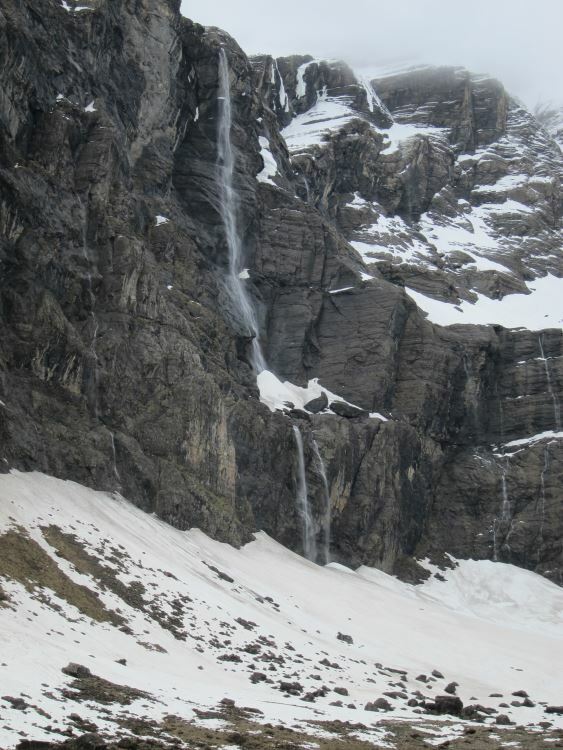 The Cirque de Gavarnie is perhaps the most famous single site in the Pyrenees, and it pays a commensurate price of crowded trails in the high summer months. 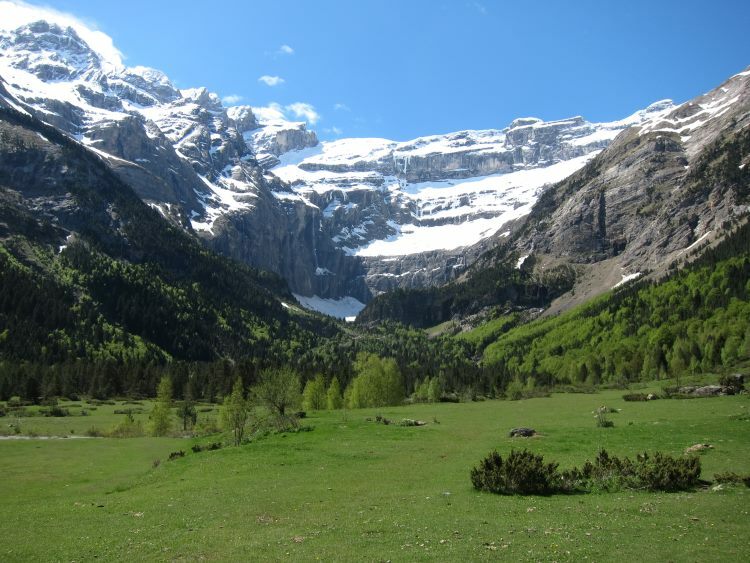 But it is famous for a very good reason: the spectacular cirque, a vast glacial scoop out of the heart of the high range, an intrusion which almost breaks through to the Spanish side. This semi-circle of cliffs, some 1,400m from the bottom to the high ridge top, which forms the border with Spain, is nearly a kilometre across (the 3,000m peaks of the high ridge are getting on for 5km apart). Although it look from a distance to be sheer-sided, the cirque's walls rise in three cliff-steps, limestone, granite, limestone, with steep slopes in between. The high cliffs still nestle the remnants of the great glaciers that gouged and then filled the cirque. The cirque is enhanced by waterfalls, including the Grande Cascade, claimed to be Europe's highest waterfall at 423m, and the Breche de Roland, a great slice in the high and surprisingly thin wall of the cirque which you can reach and pass through to access the high range (including the superb Ordesa Canyon/Monte Perdido area) and elsewhere in the Spanish Pyrenees. 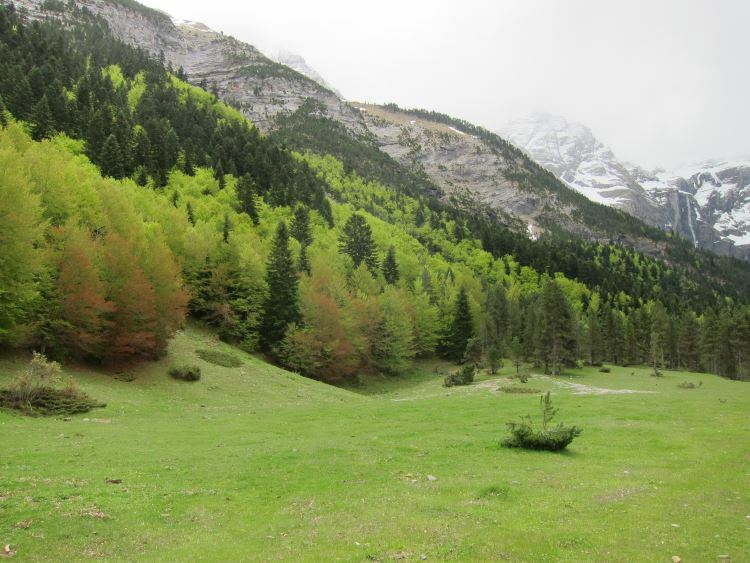 (See also our Gavarnie/Ordesa Circuit page, one of our Top 100 Walks.) 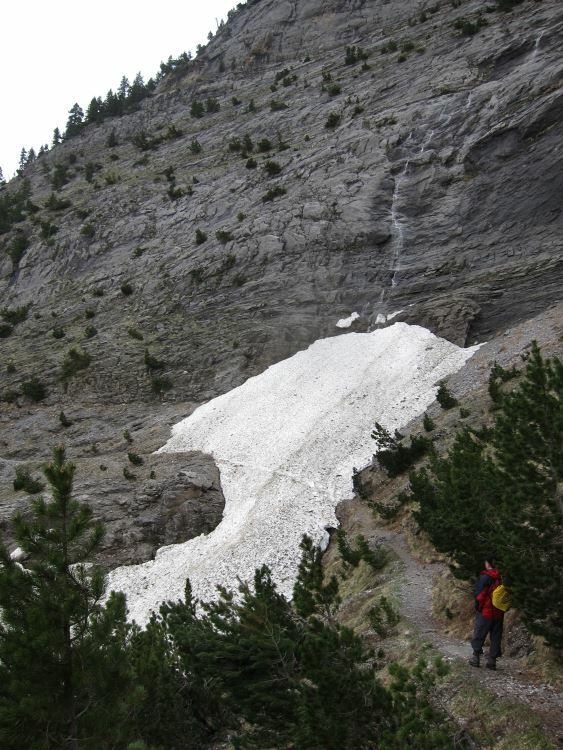 Gavarnie and Ordesa have been created World Heritage Sites together, unusually for cross-border features. The discovery of the cirque started the Pyrenees' tourism boom in the late C19, with huge numbers coming here by the mid C20. While numbers coming have dropped off a lot, you won't be alone here in high summer. To state the obvious, try to come here outside the main July-August season. 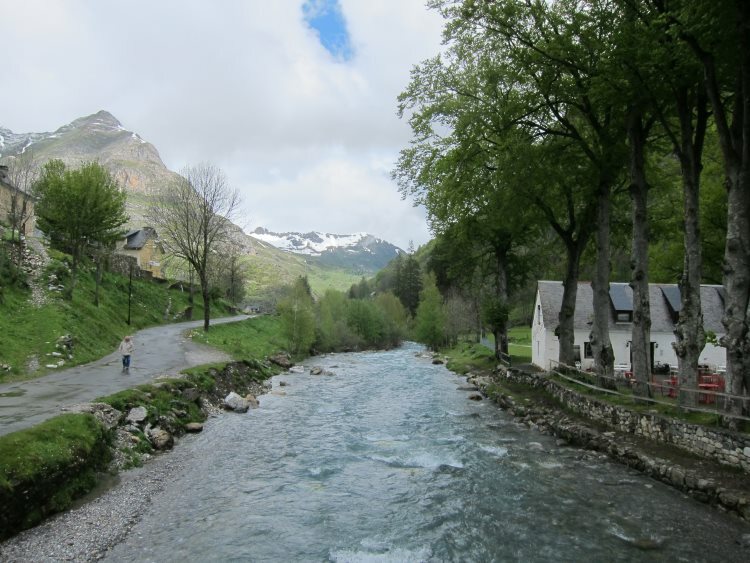 The area is home to a goodly representation of Pyreneean wildlife (we saw a large herd of izard chamois grazing along the eastern slopes of the d'Estaubé valley) and a multitude of lovely flowers and trees - the forests up the Gavarnie and Heas valleys are particularly pretty). The obvious but unavoidable, and despite the high season crowds on the main drag amazing, half day trail deep into the Gavarnie cirque. 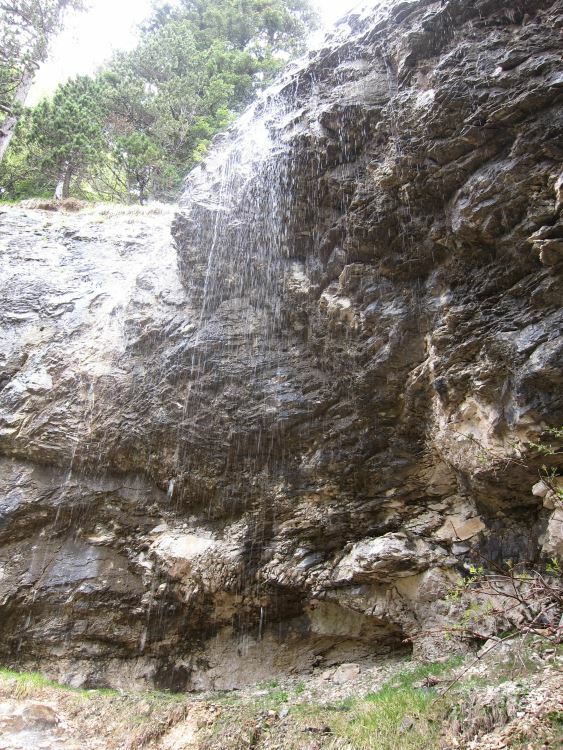 This is best walked as a circuit, entering on the "dung trail" with the muleteers carrying tourists, then walking back out either on the west side of the stream, or high on the eastern hillside. Walking to the hotel deep into the cirque takes an hour or so, passing the lovely Plateau de la Prade on the way. From the hotel the trail will be (a bit) emptier, and will take 20 minutes or so to the Grande Cascade. You will feel very small and, if not with too many fellow walkers, an elevated abasement to the majesty of nature. You can either return along the western side of the valley, or climb, or a thrilling cliff-traversing path in forest some of the time, in a bit under an hour to the Refuge de Pailla up the eastern slopes of the great valley, and thence either back down to Gavarnie or on in another hour or so up to the Refuge des Espugettes, high on the upper slopes with exceptional views. Thence it is back to Gavarnie (in about an hour and a half) or on elsewhere (see below). The 2,322m Pic de Tentes and the neighbouring Pic de la Pahule, on a ridge to the north-west, afford tremendous views all around, and deep into the cirque. They are easily got to from a side road up the western ridge (an excellent introductory walk for the area, which you can extend by traversing to the nearby lake to the west or walking on up the (unused) road to the Port de Boucharo for more hiking over the Spanish border (see below), or you can beast yourself up there from the valley bottom. La Breche de Roland is a walkers' magnet, an extraordinarily atmospheric great cleft (at 2807m) in the high walls above the cirque, supposedly gouged out by the dying Roland with his magical sword. 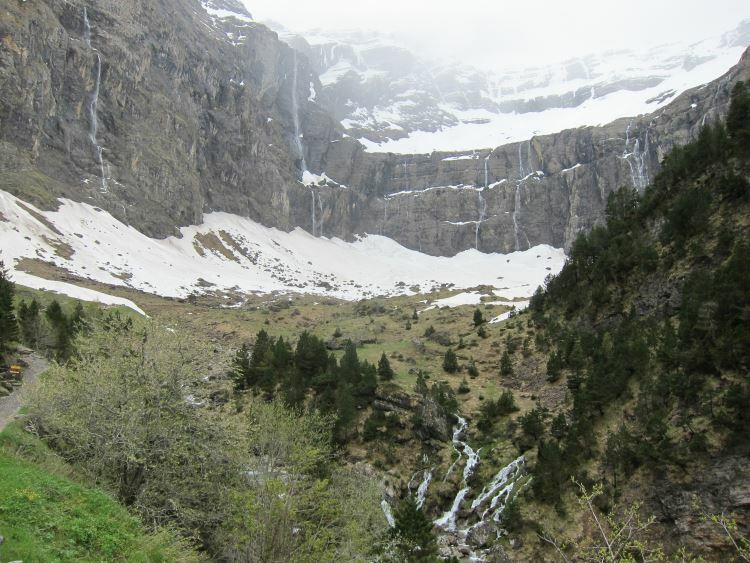 Through it you can get to the high range and Spain, the fabulous but very different Ordesa Canyon in particular. Mont Perdu (Monte Perdido), at 3355m the Pyrenees? second-highest peak, and some famous ice caves are all accessible the other, Spanish, side. 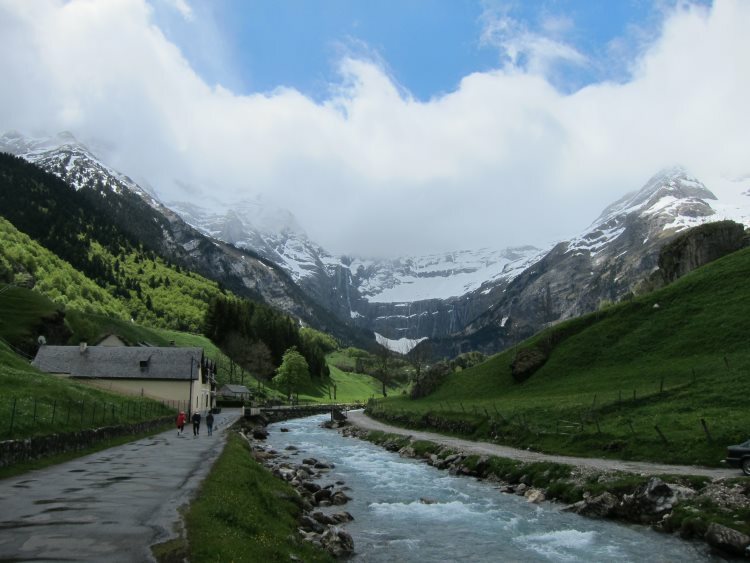 You can walk to the Br?che and back from Gavarnie in a long 10-hour + day (much shrike from the Col de Tentes, or walk up to the Refuge de la Br?che Roland (also called the Refuge des Sarradets) below the br?che, stay the night and then attack the high country through the br?che the next day. There are three ways of getting to the br?che, all going via the refuge: an easy way from the Port de Boucharo road; a long but no too hard climb from Gavarnie; and a tough and exposed climb up the cliffs and slopes from the very heart of the cirque. 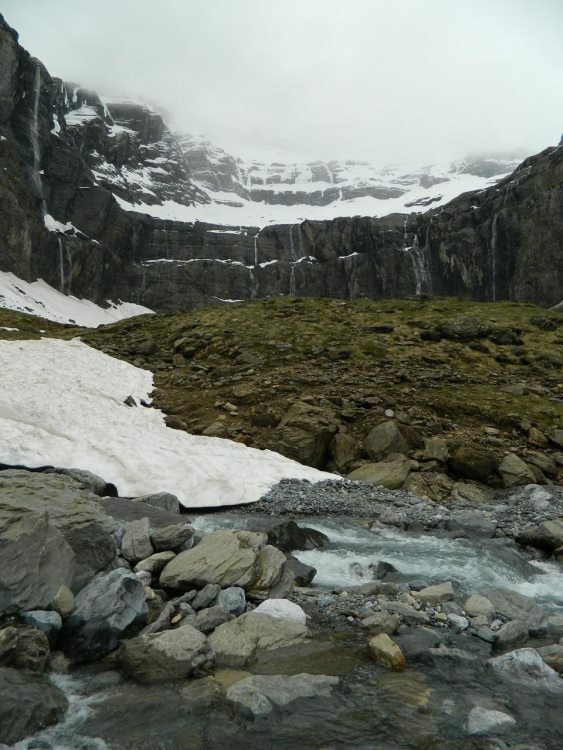 From the refuge it is 220m and less than an hour to the br?che, but involves crossing a potentially dangerous ?glacier? (ice-slopeone of the last vestiges of the vast sea of ice that once filled the cirque), for which crampons and an ice axe are strongly recommended at certain times, although we crossed it painlessly in late September. The views from the Br?che are very different directions. 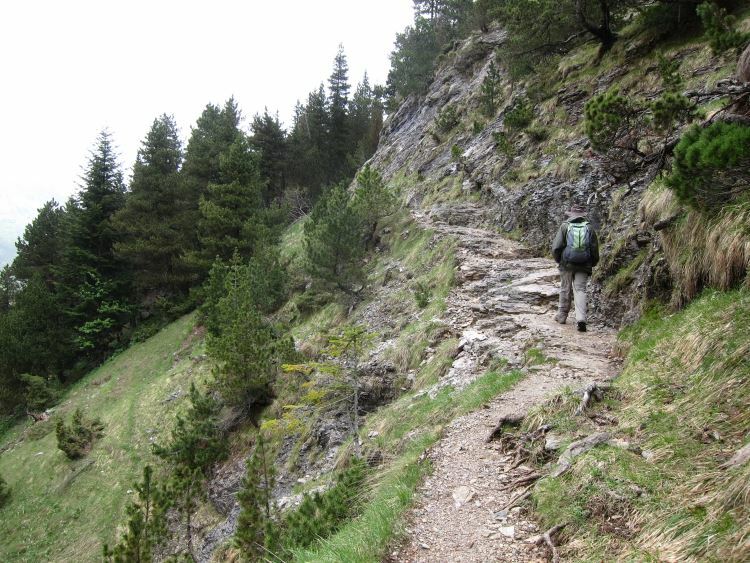 From the Port de Boucharo on the Spanish border (accessed from the car park at the Col de Tentes), an old trading and smuggling pass, there is a fine selection of high-country trails and you can join the Haute Route for a few hours. The Espugettes refuge sits in a glorious position high above the tree line on the eastern wall of the Gavarnie valley. It is a bit of a climb to go to just for itself, but is a wonderful base for crossing through the Hourquette d'Alans into the d'Estaubé valley, or climbing Piméné on the high ridge between the two valleys. An easyish but fine walk is the two hour circuit up to the Plateau de Bellevue above the valley between Gavarnie village and the cirque, a lovely stretch of meadows with fantastic views straight into the cirque. From here you can make a circuit through lovely openish forest back to the valley below the cirque itself and thence back to the village. Or you can explore up the Vallée des Pouey Aspé on the path which leads to the Pic de Tentes, Port de Boucharo and the Breche de Roland. - The Cirque de Troumouse, which is utterly and thrillingly different from its western counterparts, a huge (10km across, apparently) theatre of cliffs and peaks surrounding rough, lake-studded ground with a raised rocky hill at its heart which commands tremendous views around the cirque. You can also traverse out round the hillsides above the Heas valley toward Gavarnie (see below). - The Cirque d'Estaubé, a wonderful, long but gentle hike up a gorge then a lovely grassy valley to the bowl below the superb face of the eponymous cirque, from where you can hike back over a high col to the Espugettes refuge and thence Gavarnie. - The lovely high-level traverses from just below the Auberge de Maillet round the hillsides above the Vallée de Héas to the Barrage des Gloriettes (at the bottom of the Vallée d'Estaubé), and/or on from the barrage round the Piméné massif and back high up the eastern wall of the Gavarnie valley (and thence to Gavarnie itself, with huge views all round. 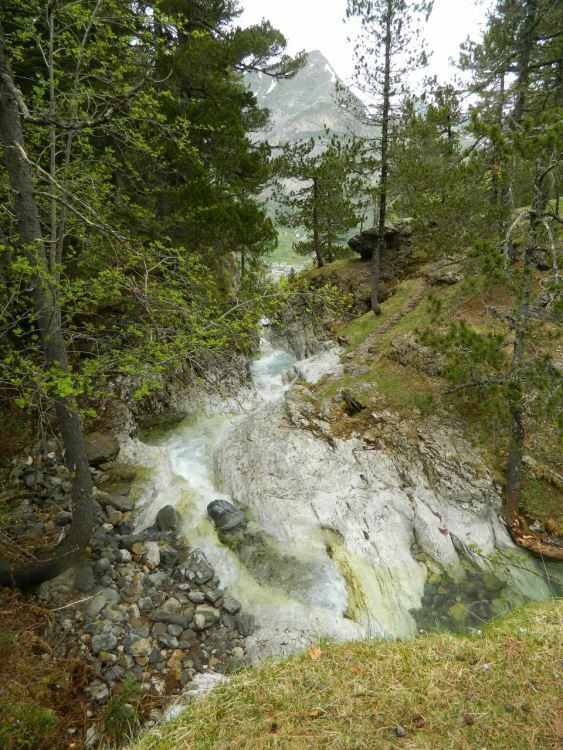 - There is a fourth fantastic cirque in the Gavarnie region, east of Troumouse, de Barroude. Mainly approached from Héas on a long but superb trail (on the Haute Route) which crosses two passes, it is an isolated place and commensurately gorgeous, with an enormous rock face and a pass through to Spain. You can stay in a small but popular hut. It is also accessible from the north-east, up the Géla valley. 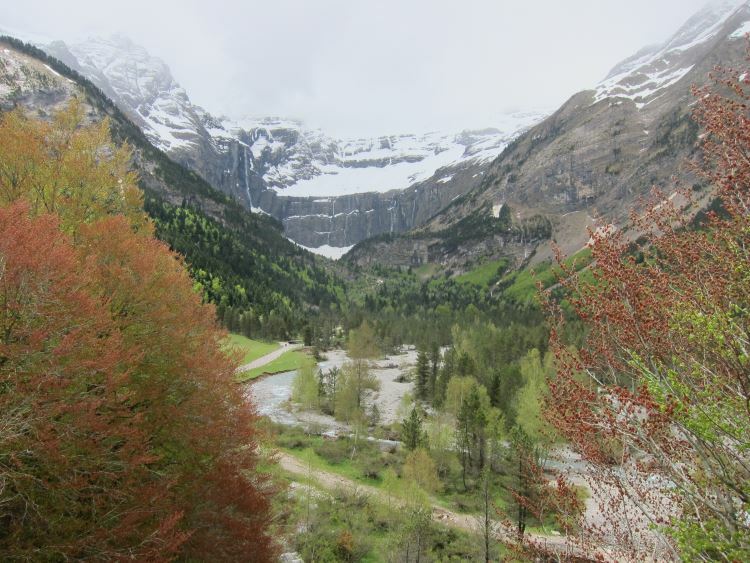 While its valley is lovely - meadows and woodlands crammed below tough cliffs on both sides - Gavarnie itself isn't specially thrilling (and is thronged in summer), although it has cleaned itself up over recent years. Gedre, downstream, is a nicer village (although itself, in 2013 at last a bit depressed-looking in a tidy sort of way) and a good base, with a road heading off to the area's two other great cirques, Troumouse and d'Estaubé. The essential book for this area is the excellent Cicerone, which has further walks you should think about. 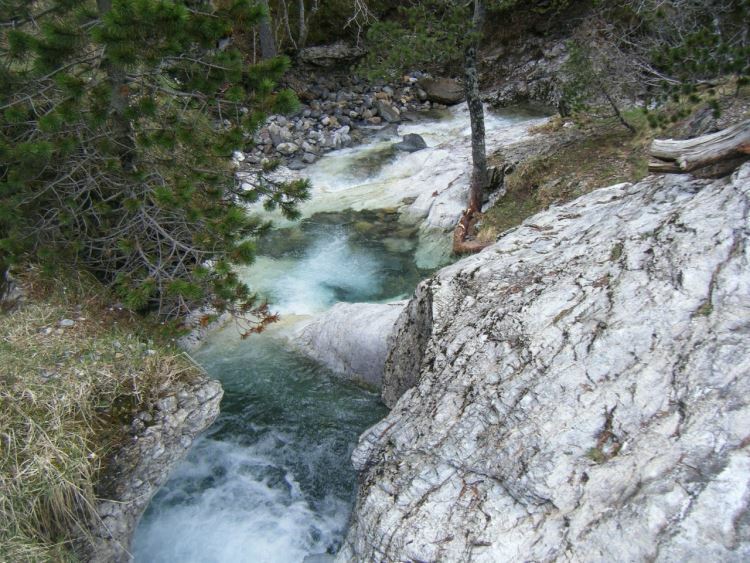 SEE OUR PYRENEES PAGE FOR FURTHER PRACTICAL INFORMATION, IDEAS AND PHOTOS.